This is a new swim course which I believe will be a future classic event. The full route stretches from Seatoun Wharf, past Scorching Bay, around Point Halswell lighthouse, across to Point Jerningham, and finishes at Freyberg Beach. There is a new date of January 26th due to poor weather conditions on the advertised weekend. If the weather is not conducive on Jan 26th to safe swimming an alternate swim course will be run from Petone Beach - a 3 km and 6 km swim from the western end of the beach. Details will be sent out to all registered swimmers if required. 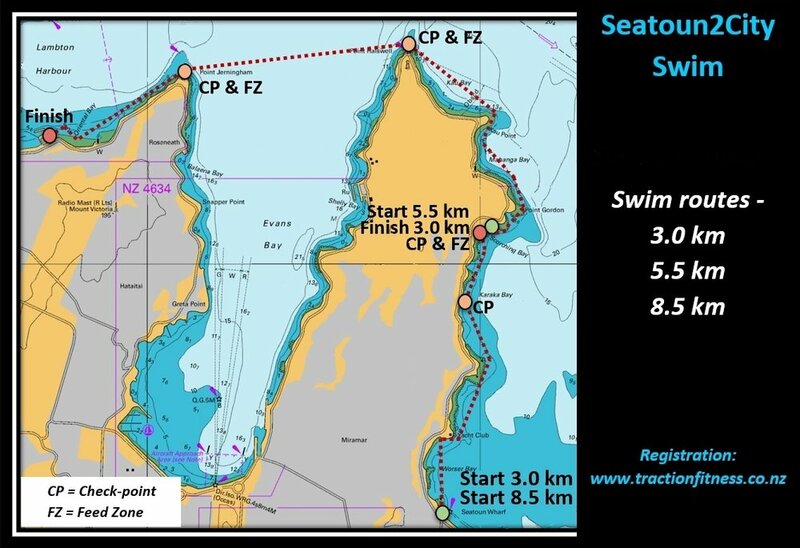 What’s special about the Seatoun2City event - the long and medium courses are brand new so you will be a first time finisher; there are great coastal habitats sporting giant seaweed gardens along the way; it’s an interesting swim with lots of bays to navigate along the way; you pass by golden beaches; you swim around a lighthouse; you swim between lighthouses (Pt Halswell to Pt Jerningham); and finish in the city, which will give you an awesome sense of accomplishment. Scorching Bay - 3 km swimmers finish here. This is a Checkpoint for the 8.5 km swimmers and it’s a start point for the 5.5 km swimmers. There will be 2 different groups start at this point depending on estimated speed. Welcome. We hope you have a great day out. There are cafes along the route to enjoy and swimmers can be talked to at Scorching Bay, Pt Halswell Lighthouse & Pt Jerningham. Be very careful when parking cars and crossing roads. Particularly around Point Halswell and Point Jerningham. There is limited parking available and traffic moves quickly around these corners.